Absolute beach front in contemporary tropical style, this villa with infinity edge pool is an ideal hideaway. Ban Laem Sor, named after its location in Laem Sor village, is a beach house of contemporary tropical design, with emphasis on outdoor living. 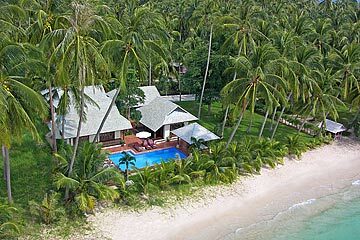 Located on one of the most unspoiled beaches on Samui, in a quiet locale that retains the original native charm of the island, the property enjoys fabulous sea views of nearby deserted islands. Ban Laem Sor is made up of 4 buildings. Closest to the beach front are the living pavilion and the 2 master bedrooms. Situated slightly behind are the 2 other pavilions hosting the kitchen / dining and 2 bedrooms. Outdoor living areas consist of paved terracotta patios, and wooden decks. The two master bedrooms feature king-size double beds and en-suite bathrooms. The two additional bedrooms, one queen-size double and one twin, share a bathroom. The spacious kitchen features an island cooking unit with overhead extractor, and ample worktop for elaborate food preparation. A long dining table comfortably seats 8, and both cooking and dining are enhanced by the sea views. An attached utility room offers storage and laundry facilities. Set amidst verdant lawns within a palm garden, Ban Laem Sor is very child-friendly. The infinity-edge pool lies within a couple of steps of the white sand beach, and features an adjacent sunbathing deck with loungers, and a shady poolside open pavilion. On the southern coast of Koh Samui, about 35 minutes from the airport, 15 minutes from Lamai, and 25 minutes from Chaweng. Samui golf club is around 30 minutes drive away. -Airport transfers are charged at $50+ USD per trip, for up to 9 passengers, subject to 7% tax.